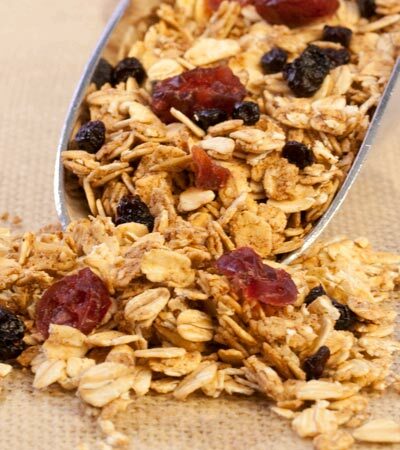 When I set out to make my own granola cereal I wanted something I could really feel good about eating and would help me keep my weight down. I only use a tablespoon of peanut butter as a fat instead of oil. Lots of cinnamon and just a touch of agave and brown sugar to sweeten it all. 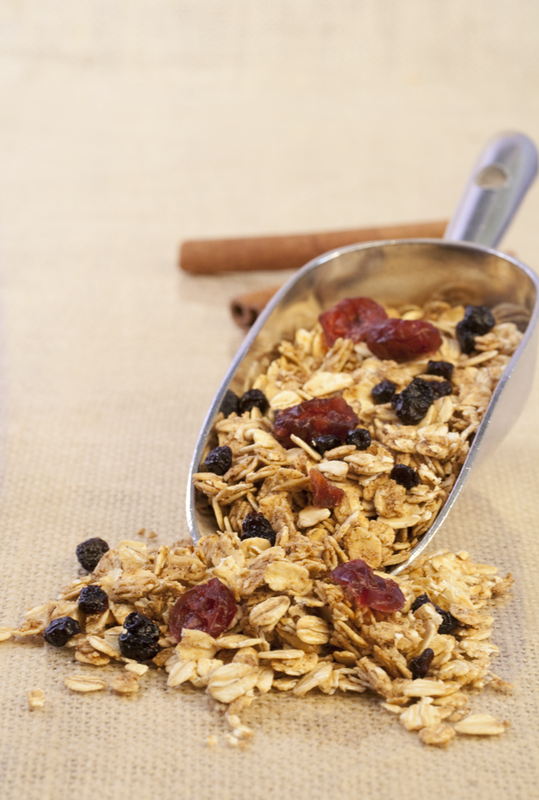 Besides being lower in sugar and higher in fiber than store bought granola cereal, it's more fun to make your own. Want to know what others thought about this recipe? Would you like to comment on this recipe? Go to the Homemade Granola Cereal blog entry. In a large mixing bowl mix together dry ingredients. Now in a coffee cup mix together the wet ingredients and pour on top of the dry ingredients and massage it into the oats until the wet disappears into the oats. Now place this mixture evenly onto a cookie sheet and place into the oven. Bake for 30 minutes and in between baking take them out of the oven and toss them around with a spatula and then move them around until they are evenly spaced on the sheet and place them back into the oven. After the cereal has baked let it cool for 30 minutes. Now add the dried fruit and mix together with your hands. Place and store the cereal into an air tight container. This cereal keeps for up to a month or longer.